Septic systems range from the very simple to the extremely complex. Even on the simplest septic systems there are still many things that can go wrong. If you believe that septic systems are something you bury and forget about, then I guarantee that you will come across many of these problems. There are simple things anyone can do to keep their septic system running properly for decades. First a general description of a septic system. The system starts where the common drain leaves the house. This drain can go to a municipal sewer or to an individual septic system. The water flows by gravity into the septic system. The inlet to the septic tank is protected by a T shaped baffle. It is open on the top and bottom. It is designed to contain floating debris in a small area and to direct solids to settle down towards the bottom. The water is contained here where solids settle out to form a sludge layer and floating objects form a scum layer. In between there is a clear zone where the water has very few solids. The water in the tank is treated by anaerobic bacteria. The bacteria break down organic compounds in the water until there is almost nothing left. The water leaves the tank through another T shaped baffle on the other side of the tank. This one goes down to the clear zone and allows clear zone water to exit the tank without coming into contact with the scum layer. Some tanks have a septic pump, the pump is installed on the opposite side of the inlet and at the expected height of the clear zone. Larger tanks might have a dividing wall to keep sludge and scum on one side and clear water on the other side. The sludge layer if not removed every three to five years can cause a major failure of the entire system. Not everything can be broken down completely. There are always things that either never breakdown or breakdown too slowly and they accumulate. 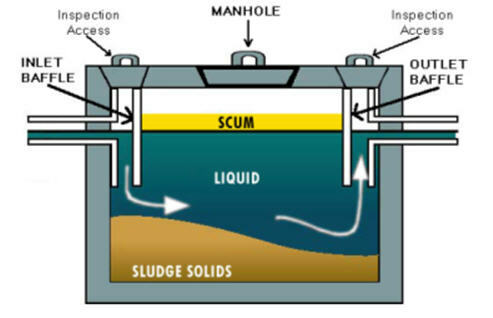 The sludge layer will eventually reduce the capacity of the tank and the solids will block the inlet or the outlet of the tank. The sludge layer will be a rapid problem if the people using the system treat the toilet as a garbage can. The scum layer is all the floating solids the get flushed into the system. Grease and oils cause a large part of the scum problem. But they are far from the only culprits. Cooking oils and grease coat the walls of the pipes and tanks and slowly reduce the size of the of the inlet and outlet eventually blocking them, and you can see how that is a problem. The drain field is where the treated effluent gets released back to the environment. It may be called something else like a tile bed or weeping tile. They are usually subterranean but can sometimes be on the surface. Regardless there are still buried pipes and they are easy to collapse if you drive a vehicle over them. Lawn tractors are OK but even compact cars are too heavy for the shallow plastic piping. If the piping becomes cracked or even a section collapses then pipe will become blocked with dirt and your waste water will have nowhere to go except back into the house. Hydraulic overloading is the technical name for putting too much sewage into your septic tank. This can happen if you have a party and there are more people using the system or if the sludge layer reduces the capacity of the tank. The end result of overloading is that poorly or untreated sewage leaves the system negatively impacting the surrounding area. Leaks are bound to occur with age. You can also create leaks by driving over the tank and excavating too close to the tank. Leaks are a huge problem once they occur. The groundwater and soil contamination is extremely expensive to clean up. You may also be liable for damage to the neighbor’s water supply depending on the riparian laws where you live. A leaking tank needs to be replaced immediately. Proper maintenance will prevent most problems. The worst thing anyone can do is to bury the septic system and forget about it. Children are excellent at picking new information however children often find learning survival skills difficult. Even when they do remember what to do to survive, will they remember to use the skill when they need it? Educating children for wilderness survival needs to be very simple and driven home with a demonstration. Take for example the simple skill of having and wearing a warm hat. Exposure to the elements is something that is very dangerous. It can be fatal to adults and children are even more sensitive. This may seem like a simple thing, wearing a hat is definitely a simple thing but have you ever tried to keep a hat on a child under ten years old? This is an almost impossible task, except when NOT wearing a hat is too painful like in extreme hot or cold temperatures. Waiting until it is too painful before you put on a hat might be too late in a survival situation. Here is an experiment you can do with kids to show them the importance of keeping insulated. It is called the Lids On experiment. What you will need is very simple and you may already have them in your house. 1) Two pots of equal size with lids. 2) Two thermometers. It can be done with one thermometer but it is more dramatic with two. More drama increases the likelihood of them remembering the lesson. The procedure for the lids on experiment is very simple as well. And there are many possibilities for side lessons some of which I will point out. 1) Measure out the same volume of water and pour it into each pot. 2) Bring both pots to a boil at the same time. 3) Turn off heat source for both pots at the same time. 4) Measure the temperature of the water and note the time. 5) Leave the water to cool on the stove. But leave one pot with it’s lid on and one pot without a lid. You can do the entire experiment again and leave the pots outside and watch the temperature drop faster. 6) Have the kids guess which will cool faster, lid on or lid off? 7) After approximately 10 minutes return and measure the temperature of both pots. The pot without the lid will be significantly cooler. This is because the lid traps warm air around the top of the boiling water. (Just like a hat does for our heads). The water not protected by the insulating effect of the air is exposed to the elements and heat is actively lost very rapidly. (Just like our body heat when we are improperly protected from the elements). This experiment can be more than a survival lesson. You can expose children to the safety precautions around the stove/cooking, the physical properties of water (why it boils and at what temperature), how to tell time or read a clock, how to measure volume/temperature and how to ask a scientific question (hypothesis) and test for an answer. I would only add more information about the experiment if the child or children are really demonstrating that the survival lesson has been learned and internalized. Saying the phrase “lids on” after the experiment has been completed when the child is putting on a hat will help drive the message home. So will playing a Simon Says type game where the commands are Lids On and Lids Off. Lids On instructs that they put on a hat and act warm. Lids Off instructs that they take off the hat and act cold. The repetition after the experiment will be the best thing you can do to maximize the chances that they will remember to put their lids on when they really need to. This is my latest article on what is important for rebuilding society after a societal collapse. Agriculture is important for obvious reasons. Without an adequate food supply there is no possibility for any society. Agriculture is the only long term method for managing the food supply. Hunting and gathering take too much time and area for current populations. Storing food is very temporary and doesn’t last very long. Trading for food is something many countries do today, but this is dependent on a very reliable transportation network. The lowest level of sustainable agriculture is subsistence agriculture. This means the levels of production from agriculture are just enough to sustain your own existence (or your family’s existence). Subsistence agriculture is very time intensive. It leaves you with little to no time for other things like education, construction and any other form of employment. Societies heavy with subsistence agriculture are also societies rampant with poverty. Subsistence farming is not a way to grow a society, it is merely a way to survive. 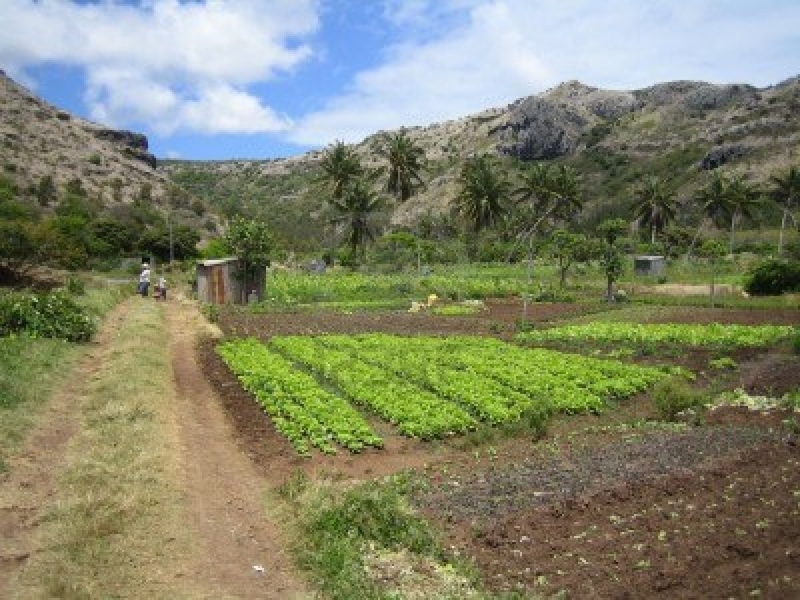 After a societal collapse, subsistence farming will become common place. Those with knowledge and the means to grow food will probably be able to produce ample amounts of food. It is everyone else who will struggle to achieve a subsistence level of food production. Those that fail will probably die from starvation. The knowledge required for successful agricultural production needs to survive the collapse. Books on the subject are a good start. A much greater resource are people who are already successful at propagation of food plants and raising livestock. Agriculture at any level is more complicated that putting seeds in the ground or letting a herd roam free. There will be local conditions that determine best chances of success. Soil and weather patterns vary widely at surprisingly small scales. If someone you know has knowledge like this, make them your new best friend. Historic techniques for farming will be very useful. Many modern crops and farms are dependent on pesticides and fertilizer. Unless someone knows how to continue making these chemicals, those supplies will quickly run out and in some cases expire. Ideally, the knowledge required is more than just historical farming techniques as many of them were destructive to either the environment at large, water sources and soil quality. The best knowledge to have are the low technology techniques for treating current agriculture problems. A good example of what I mean is how flies around cattle can spread pink eye around the herd. Currently this is usually controlled by a bovine insect repellent sprayed over the cattle. It works great at keeping flies away, but after the collapse the industry and transportation infrastructure may not be present or reliable. A low technology solution is to feed the cattle garlic. Something in the garlic makes the cattle less appetizing. You may not notice less flies around the herd as you would with the insecticide, but the infection rates of pink eye will go down, and isn’t that the problem that needed solving? With the prevalence of garlic worldwide, this solution for pink eye cold be done by almost any cattle farmer (I’m not sure if garlic would affect milk taste in a dairy cow). My point is, all the farmer needs is to grow some garlic and he/she has something with multiple uses and is dependent on nobody to do it. After subsistence level agriculture, comes increasing levels of food security, wealth and time. Historically we moved beyond subsistence farming by improving techniques and creating new techniques, new hybrid crops and breeding animals to better suit local conditions. This was achieved through research, experimentation and trial and error. After a collapse, research and experimentation will probably stop, leaving just trial and error and people who know better slowly spreading the best techniques through word of mouth. As society begins to reform, places with food will become boom towns and places without will disappear. Sustainable agriculture is the best way towards a stable society. Can I use a storm-water pond as a back-up source of water? Storm-water ponds are the closest alternative source of water for many people living in urban areas. In an emergency this source of water may be all that is available to you. Eventually any water you have stored will be consumed and the water in a storm-water pond may be the difference between life and death. With the proper treatment your local storm-water pond can be a great backup source of drinking water. Storm-water presents a unique set of challenges during treatment. Because storm-water ponds collect surface water, the water is exposed to all the contaminants on the ground in the catchment area. This includes but is not limited to pesticides and fertilizers applied to lawns, motor oil and gasoline leaking from vehicles and litter like cigarette buts. It all ends up is the storm-water pond. Those chemicals are already in storm-water ponds on a normal day. During an emergency there may be additional contamination from sewage runoff from an overloaded or broken sewage system. The water in the pond will also contain all the microorganisms like ecoli, giardia and cryptosporidium normally in surface water. Any one of these will make you very sick if you get infected with them. Finally, there will be high levels of nitrates in storm-water ponds. Too much nitrates consumed by young children can cause blue baby syndrome. The first step in treating water from a storm-water pond is straining. Straining the water through a cloth or loose sand filter will remove large particles (ones you could pick up with your fingers). Remove as much of the suspended particles from the water as you can. Straining the water first will extend the life of your proper water filter. If you have a clarifying agent like aluminum sulfate, this is the best time to add it to the water. It will make contaminants too small to be filtered become attracted to each other and become significantly larger. Larger particles are easier to remove from the water. Let the water sit still for at least 30 minutes without disturbing it. All the newly formed large particles (called floc) will sink to the bottom. When you take the water from this container, make sure you leave the majority of the settled material at the bottom of the container. The next step is to filter the water. Filter the water even if it looks clear, the human eye is five times too weak to detect dangerous levels of particles. Filter the water at least once through an activated carbon filter. Activated carbon is known to remove many different chemicals from water including pesticides, chlorine and fluoride. Activated carbon is not the same as charcoal. Charcoal is similar, it can remove toxins from water but it is nowhere near the efficiency of activated carbon. The third step is oxidation. Oxidation will help with disinfection as most disinfectant chemicals are also oxidizers. Chemicals like sodium hypochlorite and potassium permanganate are both oxidizers and disinfectants. Oxidation will break down many of the remaining contaminants and inactivate many of the remaining bacteria. Keep adding the oxidizer/disinfectant till you can detect a residual after 20 minutes. The 20 minutes is the minimum you should wait for a gallon of water. Wait longer for larger volumes. This is because oxidation is a chemical reaction that isn’t instant. It needs time to complete the reaction. The fourth step is to filter the water again. Filtering again is necessary because the disinfection/oxidation step will create some potentially carcinogenic byproducts. We filter before oxidation to minimize the amount of chlorine (or other chemical) and to limit the possibility of forming dangerous byproducts. We filter the second time to remove any byproducts that have been formed. The final step is to boil the water. This will help with disinfection, but the main goal of boiling at this point is to remove any volatile chemicals. Any chemical with a boiling point lower than water will be removed after boiling. A note about disinfection. If all of these steps are followed there is no need for a step dedicated for disinfection. Between the oxidation and the boiling of the water any microorganisms will be inactivated. If you are storing the water for a long time then add some sodium hypochlorite for a residual disinfectant. The residual disinfectant will prevent the water from becoming recontaminated before you drink it. One additional possible step is to aerate the water. Ponds are frequently stagnant. Stagnant water is green with algae, it smells bad and tastes worse. After the water is made potable, transfer the water back and forth between two glasses. This adds oxygen to the water and will make the water taste better. This may seem like a lot of work for something as small as a storm-water pond. What I have described are the basic steps to turn the potentially toxic water in the pond into clean and safe drinking water. The very first thing to learn is that there is no magic bullet. There is never a single product or technique which will always make water safe to drink. Combining, knowledge, multiple storage/treatment techniques and multiple products for storage/treatment is the best way to guarantee a safe source of drinking water for yourself and your family. This logic or philosophy of combining as many protections as possible is used by municipal water systems all across North America. It is referred to as a multi-barrier approach and it boils down to having many different protective measures to prevent contamination, in the event that one barrier fails, there are still many others in place. To put it in layman’s terms, when it comes to water security, it isn’t a good idea to put all your eggs in one basket. Marketing campaigns will make all sorts of claims about water products. Some will be irrelevant, like claims of BPA free plastic when the product is made from a type of plastic that never had BPA. Other claims will be over stated. The claim that is most often overstated is the number of times a water treatment product can be used. The quality of the water being treated is too variable for any company to give you an absolute number of times. This might not be done to deceive you. It could just be that the water they tested the product with was easier to treat then your water. Remember that no product will make the water perfect. They will make the water safer when used correctly, if used incorrectly many water treatment products can make the water significantly more dangerous to drink. Water needs to be stored in an appropriate container. This container needs to be able to physically hold the weight of the water and not leach any chemicals into the water. Assuming any garbage can sized container is appropriate will at best lead to soggy disappointment and at worst a severe case of gastrointestinal disease. For more information on water storage, read The Why? How? and How Much? of Water Storage? Once your water is stored it needs to be kept safe. Water can become contaminated at any time. Anytime the container is open there is potential for contamination to occur. Read this article to find out what to do when your backup source of water becomes contaminated. The assumption that water only needs to be treated once is false. What was once safe to drink may be very dangerous when you need it if your aren’t protective of your supply. Water can turn stagnant when stored for long periods of time. Stagnation while not a health hazard is a taste hazard. Stagnant water tastes bad. Adding air to the water is how you relieve stagnation. Adding air is as simple as passing the water from one glass to another repeatedly or stirring the reservoir. The goal is to increase surface contact between the atmosphere and the water. It is important that aeration of the water will also remove the remaining chlorine (if any was present) in the water. If you are aerating the reservoir make sure you add some more disinfectant. Do this so you can keep your disinfectant residual high enough to keep the water contamination free. Another mistake people make, is they store water but make no changes for reducing the water they use. Forgetting to change behavior during a crisis is probably the biggest mistake beginners make. Different situations require different behavior, this applies to your personal water use. You will be amazed at how much water is used if you aren’t careful. What could last a week might be used in a day and then you will understand the true value of water conservation. This mistake can also happen in more than just your water use. For more information on water conservation read why water conservation is a prepper’s must do. The single biggest mistake beginners is they assume that they can learn how to treat water later. Later becomes too late and then it can become fatal. It is very difficult to learn something complicated like water treatment when your life depends on it. Learning as much as you can before an emergency strikes is the single best thing you can do to stay safe. This article covers just a few of the common mistakes I see people make when they start taking their water security more seriously. There are many more mistakes that can be made and no one person has the perfect solution to them all. Water security is something that needs to be tailored to each person or family’s needs. Have you found any common mistakes while preparing for water shortages? If so, leave a comment below, I would love to hear them. Energy efficiency is important to everyone on the planet. There are many things you can do to reduce energy use across your entire home. There are some big ticket items that have a huge return on investment. Primarily, using only high efficiency appliances will significantly reduce your costs. Secondly, construction techniques and materials that help you save energy will also save you a lot. Things like installing proper insulation, double pained glass windows and sealing drafts are simple things any homeowner can do. You can spend a lot of money on equipment to lower you energy consumption, however there are some things you can do outside your home which will help your pocketbook. Landscaping is an overlooked way you can change the amount of energy your home consumes. The orientation of your home is important. Houses that face south tend to have lower heating cost and higher cooling costs. This is from more direct sunlight hitting the home. Conversely, homes facing north have the opposite benefits. This may seem like it wouldn’t make a difference. Assuming two identical houses on the same property but one facing north and one south, how could they consume different amounts of energy?. The difference in the amount of home heating from the sun comes from the fact that most houses have more windows on the front of a house. Windows let sun into the home, and that sun heats the interior directly. So you can see how orientation can affect heating costs. To be completely specific, the “front” of the house is irrelevant. But the total amount of glass facing south is very important. If you want to heat your home easier have more glass, want to cool it easier then have less glass. Below is a paragraph outlining how to get the solar heating in the winter and some cooling in the summer all with planting the right kind of tree. Deciduous trees should be planted on the south side of the building. In the summer the tree will provide shade and cool the house. In the winter when the leaves are all gone more sunlight will hit the house and help heat the home. On the north facing side of the building an earthen mound will mitigate the worst winter temperatures. You can also build into the side of hill if one is available. Earthen material does nor change temperature as fast as the atmosphere and it will block even the most fiercest wind. If you look at pictures of cities in the extreme north they are usually built into the side of a hill. Anything to block the house from the typically cold northern wind will make a difference. Coniferous trees on the east and west sides provide a good wind break. 2 more earthen mounds will do this as well, but trees are much easier to come buy and are more asethically pleasing to potential buyers. Trees also make it less like you are living underground then earth on three sides would. Large bodies of water regulate temperature a lot better than land does. Water takes a long time to heat up and a long time to cool down. This is why coast areas are cooler in the summer and milder in the winter. Locating on the coast or beside a lake will help your energy costs. 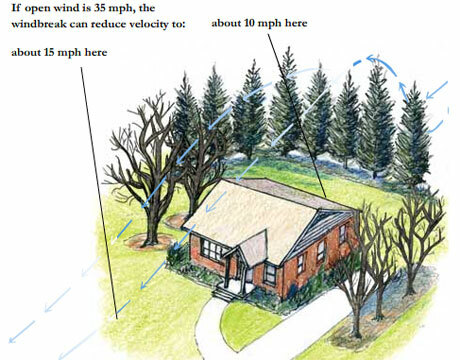 Coastal areas are also windier so the wind breaks (earth mound or trees) become that much more important. Grading of the property is also important. Most people only grade for water dispersal and to prevent water entering the home. Grading to keep water away will also help cold air flow away. Keeping cold air and excessive heat away from you home can be achieved with proper landscaping. Keeping cold air away from your home will significantly lower your heating costs. Shading the high heat areas of the home from direct sunlight will significantly lower your cooling costs. If planting some trees can lower monthly bills, then it is definitely worth doing. Storing water is often the fist step in becoming more prepared. People need water everyday for a variety of reasons. 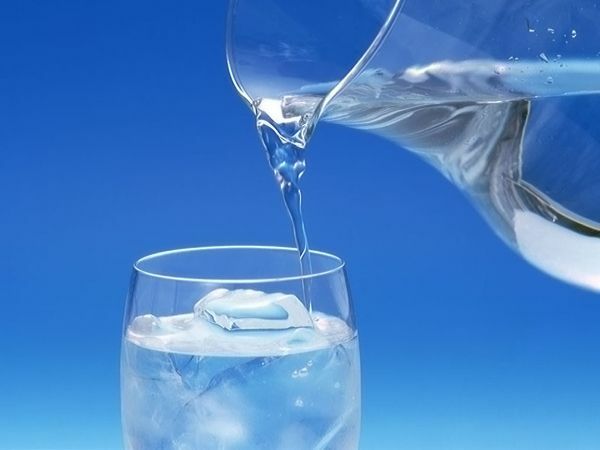 Humans can go up to three days without water, however the effects of dehydration can be felt in as little as a few hours if you aren’t careful. In an emergency water use and water needs will change and they will never change in ways where you need less water. On the surface storing water is just filling containers with water and walking away. If that is all you do then you will regret walking away relatively quickly. The only thing worse than ignoring your stored water is not having any stored water. Why store water? It buys you time. Time to “wait it out” or time to find more water. This time will allow you to focus on and accomplish other tasks. Other demands for your time will abound in even a minor emergency. If keeping some water around means you can focus on security or damage control then it is definitely worth the effort. I have written another article about why a back up supply of water is important. How water can be stored depends on a few factors. Cost and storage space are the biggest factors affecting how you store water. Purchasing bottled water is a good way to start for small places with small amounts of storage. 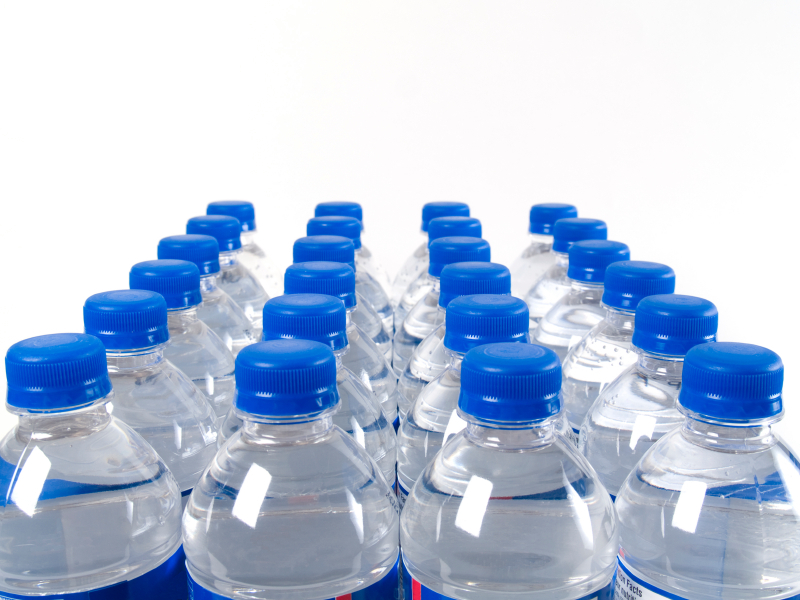 Bottled water is can be very expensive if you want to store a lot of water (more than 72hrs). The next option is a larger container designed holding water. These containers are available is almost every size. If you can’t find the size you want in a store, there are companies that can make custom shapes and sizes. There are very few limits to the type of container. I mentioned earlier that the container needs to be designed for water. This is for two reasons. First, not all plastics are created equal. Some plastics can leach harmful chemicals like BPA into the water. 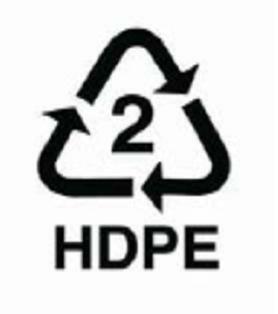 The best type of plastic is high density polyethelene (HDPE). HDPE is used on all sorts of applications, including water/chemical tanks and watermains. Look for the symbol of a triange made of arrows around the number 2 and the letters HDPE underneath to make sure it is the correct one. Second, water is heavy. One liter of water weighs one kilogram (2.2 pounds). If the container isn’t designed for water there is a good chance it will break. For example a rain barrel holds around 400L, that barrel full of water will weigh over 400kg (or approximately 881lbs). 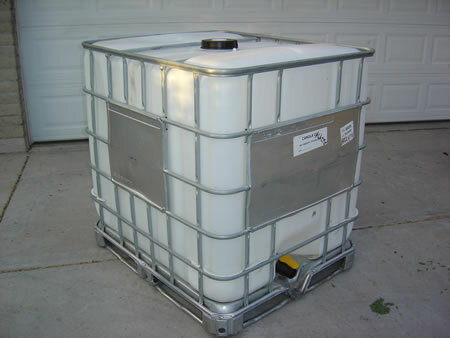 Below is a photo of a 1000L container, when full this container weighs one metric tonne (1000kg or 2204lbs). The surface under this container needs to be secure and able to support the weight. You also need to factor this weight into the support for the container and the shelving unit you store the water on. Larger tanks need to be air tight. Otherwise the water remains open to contamination. Read here to learn what to do when your back up source of water becomes contaminated. The access point if it is on the top also needs to be air tight when closed. The access point needs to be raised above the rest of the tank so no water/cleaners/dust flows into the tank. If the water does become contaminated, read What to do when your back up supply is contaminated. The tank will also need a spigot for accessing the water in the tank. The spigot should be installed just above the bottom of the tank (like it is in the picture above). Keeping the spigot just off the bottom avoids drawing any sediment that has settled on the bottom of the tank. Raising the spigot also makes it easier to fill containers. There is are many theories for what kind of container is best. One big one or many little ones or a combination of sizes. This is a decision everyone needs to decide for themselves. The general theory for using small bottles is that you can rotate your supply and if a small container becomes contaminated or leaks then you still have a safe supply in other bottles. The general theory in support of large containers is that you can store a lot more water. You can also put pumps into large tanks an pump water to other areas. With a pump and some tubing you can have a back up plumbing system or pump directly into your existing plumbing. Now for the big question, how much water do you need to store? According to the USGS, the average American household uses 80 to 100 gallons per person of water a day (302 to 378 L/person/day). Now this is for ALL uses, many of which are in our appliances like dishwashers and washing machines. But if you want everything to be EXACTLY as normal, then 100 gallons per person per day is what you need to store. A family of four, will need 400 gallons/day and most emergencies are longer than one day. This will quickly become an unreasonable amount of water to store. This is where water conservation comes in. Using less water makes your supply last longer. I can’t give you a minimum storage volume. The minimum amount of water that a human needs is variable on too many factors, like age (seniors and babies need more), climate, external temperature (hot and cold), altitude, health conditions, illnesses, type of disaster (some require a lot more washing), pregnancy, activity level, existing hydration levels and this list can be a lot longer. I will say this, having more water than you need is better than not having enough. Listen to what your local authorities are recommending you store for your area and treat that as a minimum. The correct answer of how much water to store is in between the 100 gal/person/day and the minimum recommended for your area and time of year. I hope this article helped you understand a little more about the importance of storing water and a lot more on how to get your water supply started. Everyone’s water storage solution is unique to them. Balancing space and money mean that you will have to develop a system that works for you.